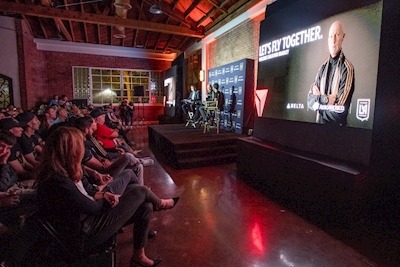 Delta and Aeromexico gave Los Angeles Football Club supporters the chance meet Bob Bradley, the team's first head coach, at an event in Los Angeles last week. 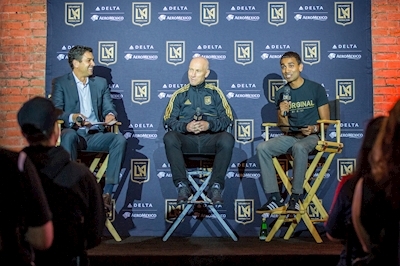 More than 250 LAFC fans showed up to meet Bradley at the event, which featured a question-and-answer session moderated by Tom Penn, LAFC President and Owner, and Ranjan Goswami, Delta's Vice President – Los Angeles and Sales, West. During the Q&A, Bradley recounted some of his most memorable moments as a coach so far and offered his thoughts on building the squad and his approach to coaching. He also thanked the many "Originals" in the room, who have supported the team since it was announced in 2014 and will cheer on the team when it debuts next season. The fans erupted into unique chants made for LAFC, including a "Bob the Builder" cheer for their new manager. Fans in attendance were encouraged to register for SkyMiles or show their membership number in order to enter a raffle for round trip travel vouchers for two to any destination between the US and Mexico, flying on Delta or Aeromexico. LAFC, an MLS expansion team, will take to the pitch for the first time in the 2018 MLS season and named the coach at a media conference in July hosted by Delta and Aeromexico, the club's official airline partners. Delta and Aeromexico are LAFC's official airline and marquee founding-level original supporters of the club. Delta and LAFC are building a better Los Angeles with Delta's $1.9 billion redevelopment of Terminals 2 and 3 at LAX and LAFC's 22,000-seat Banc of California Stadium, which is expected to open in the spring of 2018. The partnership with LAFC is an extension of Delta's Dream Up, L.A. campaign that launched in 2016 and expands Delta's partnerships in Los Angeles, which include serving as the Official Airline of the Los Angeles Lakers, Los Angeles Kings, STAPLES Center, UCLA and the Rose Bowl. To launch the partnership, LAFC and Delta created a video campaign that brings to life their collective vision that can be viewed at LAFC.com/delta.